Don’t dismiss “Mindfulness Meditation” just because it’s a buzz word lately. Practicing mindfulness techniques as a daily tool, and not only to reduce stress, is one of the best things you can do for your body, mind and overall well being. With all of the latest trending self-improvement, calming techniques out there, it’s easy to get desensitized. So much so that often we ignore the true value of some programs that promote our well-being. So if you’re truly looking to for a better way to destress and cope with life, it’s important to take the time to learn about the best ways to be more mindful. It’s time to nurture your emotional health. In this article I talk about what mindfulness meditation is, all of the benefits and most importantly, how to practice it using the best techniques. So, is mindfulness as simple as being more aware? Or is it a technique to clear and declutter your mind? Yes and yes. Being mindful, in one sense, is a way to simplify things. Normally we attempt to multitask throughout the day. We worry about 20 things while doing 10 – and not giving our full attention to any of those 10 things anyway. This does not work well at all. Being present or mindful is a state of proactive consciousness. It really means actively focusing on the present moment. Consistently being fully in the now. 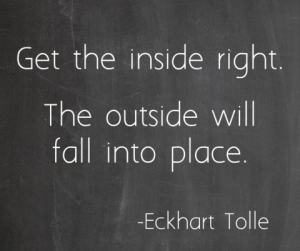 Mindfulness and living in the present allow you to tend to what’s going on right around you as well as inside you. So like I mentioned earlier, it simplifies things because you’re able to control what is happen inside and outside of yourself. This doesn’t mean that it’s “simple” to do. But it’s worth your time and effort to invest in the best techniques so that you can enjoy the present moment, improve your well-being and enjoy what matters in your life. The ultimate way to maximize mindfulness is through meditation. This is a powerful tool that you can EASILY practice throughout your day. Whatever you’re doing, being able to give it your undivided attention is key. Be proactive about doing your best to set aside your other worries and being present to who you’re with are ways to live a fuller and more abundant life. 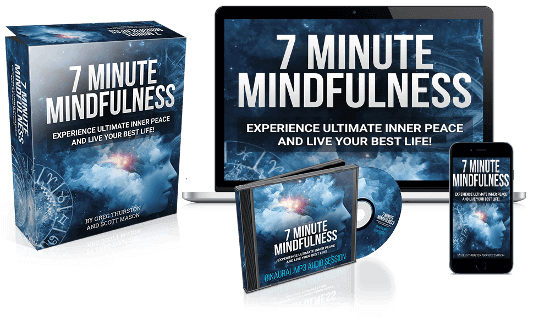 Click Here To Discover 7 Minute Mindfulness ⇦ by Greg Thurston, Founder & Creator. Thurston’s technique has been an incredibly effective way to gain self awareness, control, calmness and ultimately happiness. This mindset strategy will ‘unclutter’ your life, buy uncluttering your mind. 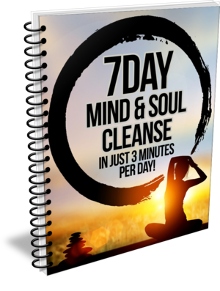 The founder is also currently offering a Free Giveaway called The 7 Day Mind and Soul Cleanse. So this is a really special opportunity to see if this program is right for you! Mindfulness a gift that we don’t give to ourselves enough or at all. In fact, society teaches that we should be accomplishing so much in as little time as possible. This mentality eventually leads to burnout, stress, health problems, and definitely lower productivity. This is why it’s critical to your overall health and emotional well-being to practice living in the present moment each and every day. In order to overcome the overwhelming impact of a cluttered or negative mindset, use the best mindfulness tools and techniques. Like any muscle in the body, training your brain to build upon and utilize its power to improve your well-being takes time and practice. So, first take a look at all the benefits of proactive mindfulness meditation. Let’s start with the greatest factor affecting most of us lately. In today’s world, we generally deal with stress from so many angles – work, family, finances, personal fulfillment, etc. If we carry around all of the burdens we are worrying about, our mind never gets a break. That’s why so many people are completely burned out, feeling down, and stressed to the point of panic attacks or needing medication. This kind of worrying also leads to negative thinking and self-talk. Furthermore, we don’t usually even realize this is happening in our minds. All of the inner dialogue of worry steals away the joy waiting for us. It also leaves little or nor time to take a mental break in order to recoup or put things in to perspective. It’s critical to learn how to use consciousness as a tool to overcome stress and anxiety. The peace of the present moment is an empowering state to occupy when you know how to find it, use it and remain in it. As you can see, trying to keep everything on your mind leads to all kinds of problems, resulting in lower productivity and even worse when it bleeds over to personal relationships and emotional well-being. Ironically, we might even feel guilty if we forget to worry about something. You’ll finally get absorbed in something and it feels great, but then you remember all the things that aren’t resolved, and you feel guilty for letting yourself have a few minutes. Being mindful and present will allow you to give your full attention to what you’re doing or who you are with. In turn, you can do better, and you’ll feel more clear and mentally energized. So challenge yourself to pause. Be mindful in one activity a day: a walk, mediation, making a craft, writing, drawing, singing, or something else you enjoy. See how it feels to allow yourself to be fully present with that one thing and not having thoughts about anything else. And then see the rest of the day rewards you. Being mindful and staying present lowers our stress levels and also centers us, bringing many health benefits. You might notice that you’re calmer after practicing mindfulness, your head feels clearer and more focused, you’re more productive, and more alert. Being mindful throughout the day greatly benefits your mind, and that in turn benefits your body and overall physical health. People who make living in the present moment a daily practice have higher brain function, an increased immune function, lower blood pressure, lower anxiety levels, and are much less emotionally reactive. We’ve heard this for years, but experts were talking about meditation and yoga. Now we know more in that both of those practices are also ways to be mindful! When you decrease stress and improve your health, it can help reduce depression. Mindfulness mediation does that and more. It’s been considered a highly effective part of overall depression treatment for a long time. Additionally, daily mindfulness techniques engage the observant self, so you can be aware of how you’re feeling, and what you’re thinking. Yet at this same time not get completely overwhelmed by those feelings. It allows you to step back and analyze the situation better. In a simple sense, neuroplasticity refers to how our brain grows, learns, and changes over time in response to its environment. When we change our mind or learn new things, we actually make new pathways. Consequently this has bigger scientific implications. When someone has a stroke and has to relearn how to walk, they’re actually learning how to re-circuit their brain around the damaged area. From a mindfulness perspective, meditation allows your brain to increase its ability to change and adapt. This is so important to navigating in today’s world. Imagine how much stronger your brain will be if you practice mindfulness and therefore improve neuroplasticity. That’s a huge advantage for dealing with all of life’s curves. Studies have found that mindfulness helps people with chronic illnesses. This shows us that the more we occupy being in the present moment, the more we enjoy daily life. Research has also found that mindfulness helps medical patients cope with and reduce stress while relieving fatigue. Mindfulness can also improve life for people with chronic pain, such as low back pain. It helps patients focus on something other than the pain. So we’ve seen all the ways mindfulness benefits our mental and emotional health. It also helps us physically when we need to recover from illness or life changing events. This is likely due to all the other benefits of being mindful – it is all connected. We have better focus, we’re less stressed, we feel more at peace, and so we’re happier and emotionally centered. We’re emotionally and physically healthier when we’re more mindful, mentally organized and we don’t allow negative self-talk to take control. Human beings aren’t made to multitask so many commitments all day long and continually worry, thus only going through the motions. We can benefit from slowing down and enjoying the present moment using the best mindful meditation techniques out there. Why let things and intrusive thoughts detract from what you’re meant to be doing? Build self-awareness in knowing that you have the ability to manage your own time while living your best life. Greg Thurston’s method will empower you to control your inner thoughts and improve your well-being to where you deserve to be. 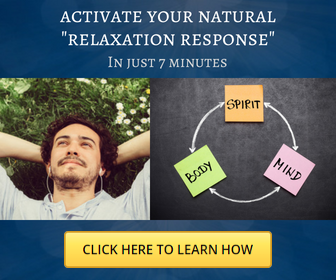 This is a technique that will allow you to sink into relaxation, and feel abundantly positive and happy within minutes. And he quickly teaches you how to easily defeat any life challenges or burdens that you may be encountering. 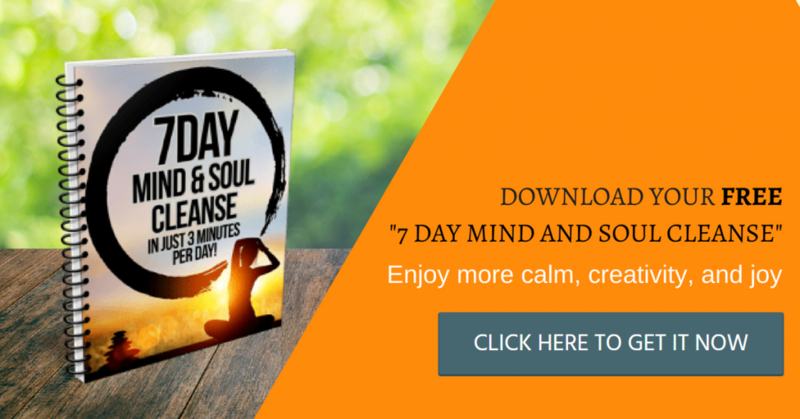 Follow this link to 7 Minute Mindfulness to learn more and please don’t forget to let me know what you think! 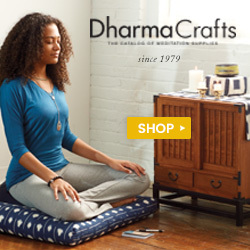 Audio Meditation, Free Giveaway, Mindfulness, mindfulness meditation, Present Moment. Bookmark.